1. Organizational aspects of the pharmaceutical organizations. 1.2. Types of pharmaceutical institutions. Tasks and functions of pharmacy organizations. 1.3. State regulation of drug circulation. 2. Licensing activity in the field of drugs. 2.1. Activities subject to licensing, and related to the field of medicines and other products sold by the pharmaceutical company. 2.2. Licensing of Certain Activities in the Russian Federation. 2.3. Licensing of pharmaceutical activity. 3. Organization of the pharmacy. 3.1. Requirements for the composition of the premises, facilities and equipment of the pharmacy. 3.2. Requirements for the organization of the storage of medicines, medical devices and other products. 3.3. Requirements for employees of the pharmacy organization. The drug provision of the population and medical institutions is one of the priorities of social policy of the Russian state at the present stage. The pharmaceutical activities as well as activities related to trafficking in narcotic drugs and psychotropic substances, in view of the potential danger of uncontrolled implementation, refer to the licensed activities. Licensing of pharmaceutical activity is carried out in accordance with the Regulations on licensing of pharmaceutical activities approved by the Government of the Russian Federation №1081 «On approval of provisions on licensing of pharmaceutical activities." Licensing activities related to trafficking in narcotic drugs and psychotropic substances, in accordance with regulations approved by the Government of the Russian Federation №1085 «About licensing of trafficking in narcotic drugs, psychotropic substances and their precursors, the cultivation of narcotic plants." Also, licensing activity is regulated by the Federal Law №99 «On licensing certain types of activities." 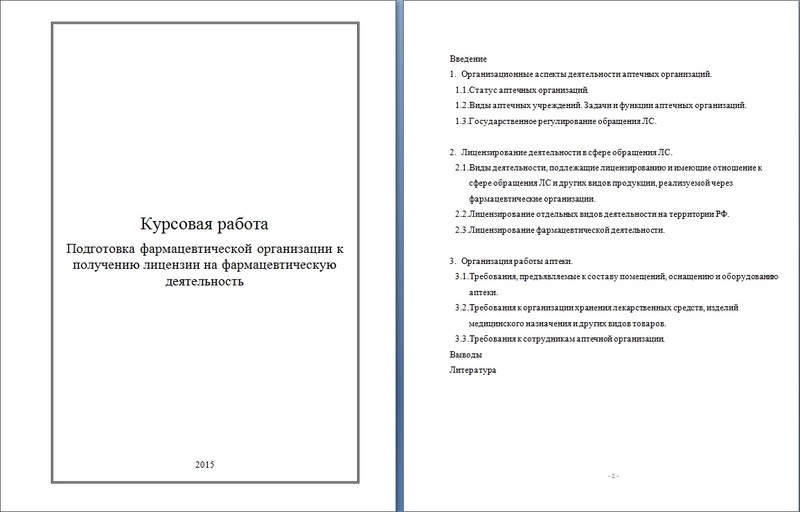 This decree and the law on licensing of defined procedure for licensing of specific activities, including the approved licensing requirements and conditions, the violation of which entails responsibility established by the legislation of the Russian Federation, as specified licensing requirements and conditions, the violation of which is subject to the qualifications of gross violations. Licensing of these types of activities carried out since the introduction of the licensing procedure in the Russian Federation, that is, since the early 1990s. Throughout this time, regulations on licensing certain types of activities are regulated by licensing requirements and conditions, including requirements for professionals whose activities are related to the handling of medicines. The objective of the course work to analyze the legal and regulatory - legal framework farmdeyatelnosti licensing and training of pharmacy organizations to obtain a license.